Passwords are passé. Two-factor is cumbersome and unwieldy. The bad guys are relentless and cunning. Yet, the future of authentication has never looked brighter. With new advances in biometrics, behavioral, risk-based technology and AI, organizations are turning back the tide of breaches. 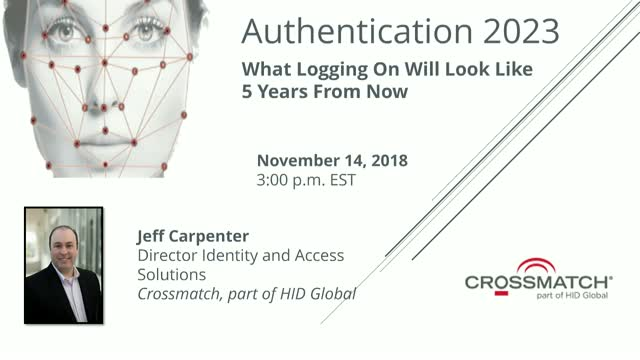 In this session, IAM and biometric identity expert Jeff Carpenter looks at what authentication security looks like in the year 2023. How the act of merely approaching your PC or device will provide all the necessary behavioral, location and biometric data needed to successfully authenticate you. The trend toward more convenient, frictionless methods will continue to its logical conclusion. Learn how to get ready for this identity sea change. Jeff Carpenter is Director of Identity and Access Management solutions at Crossmatch, part of HID Global. He has held positions with top-tier cybersecurity and technology companies, most recently with RSA, a Dell Technologies company in 2017 before joining Crossmatch. Jeff has a passion for technology, passwords, biometrics and the future of enterprise authentication. He holds both a Certified Information Systems Security Professional (CISSP) and a Certified Cloud Security Professional (CCSP) designation. Managing your user logons can be a daunting affair. New platforms, technologies, and regulations form the perfect storm of confusion. Join industry veteran Jeff Carpenter, cloud authentication director for Crossmatch, part of HID Global, as he walks through and makes clarion sense of the topics and trends that are top-of-mind of cybersecurity professionals. - Are passwords really going away? - Can biometrics be spoofed, and if so, what should organizations be asking their vendors? What are the key challenges CISOs are facing in 2019? Security leaders and practitioners are struggling to secure their organizations on a limited budget, a lack of trained cyber talent, ever-changing threatscape, and a disappearing security perimeter. Join Jeff Carpenter, Director, Identity and Access Solutions at Crossmatch in conversation with ITSP Magazine as they discuss trends in Security, RSA and fast approaching upcoming GDPR. Crossmatch® solutions solve security and identity management challenges for hundreds of millions of users around the world. Our proven DigitalPersona® Composite Authentication solution is designed to provide the optimal set of authentication factors to meet today’s unique risk requirements and afford complete enterprise authentication coverage. Crossmatch identity management solutions include trusted biometric identity management hardware and software that deliver the highest quality and performance required for critical applications. Our solutions support the financial, retail, commercial, government, law enforcement and military markets. With 300 employees and customers in more than 80 countries, Crossmatch sets the standard for innovation and reliability.